posts are in this Jharkhand JSSC Recruitment JHPCCE Exam 2018. Candidate's selection is based on written exam for these JSSC Jail Hospitals Recruitment 2018. Written exam qualified candidates only called for interview for this Jharkhand JSSC Mishrak, X Ray Technician, Paridhapak Jobs. Online applications only accepted for this JHPCCE Exam of JSSC from 01-08-2018 to 31-08-2018. Online Application form will be received through JSSC official website of www.JSSC.in. 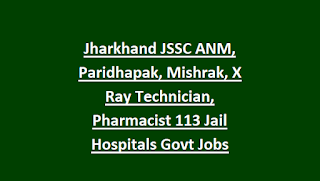 For more details regarding this Jharkhand Jail Hospitals JSSC Recruitment of Mishrak (Compounder), X Ray Technician, Paridhapak, Pharmacist and ANM and other jobs information is given below. Post Name and No of posts details are given below for JSSC recruitment 2018 of Jail Hospitals of Jharkhand state. Age limits cutoff date is 01-08-2017. Upper age limit is 35 years for general, 37 years for OBC Male candidates, 40 years for SC/ST Male and 38 years for General and OBC female candidates..
A written exam will be conducted for this JSSC JHPCCE 2018 Exam. Paper 2-Academic Subject Post related -100 Marks-2 hours duration. 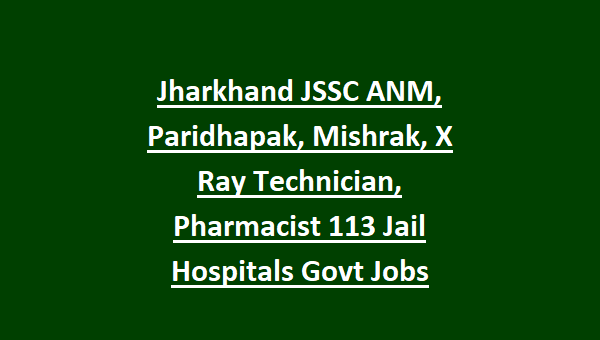 Online applications only accepted for this Jail Hospitals of Jharkhand JSSC Jobs Recruitment of Mishrak, X Ray Technician, ANM and Paridhapak, Pharmacist posts. Online application forms are accepted through www.jssc.in. Last date to apply online is 30-08-2018.